New 15.4" PowerBooks to Ship "in the Second Half of this Year"
New 15.4" PowerBooks to Ship "in the Second Half in the Year"
"According to sources, Compal will start shipping 15.4" widescreen PowerBooks for Apple in the second half of this year, with initial monthly shipments estimated at 30,000-40,000 units." FastMac is offering a new upgrade option for the Pismo G3 PowerBook with a 533 MHz CPU running at 550 MHz and including 1 MB Level 2 backside cache. The upgrade requires sending in your existing G3 processor module to FastMac for the upgrade; 7 day turnaround service is quoted. PowerBook Zone has imported a batch of Matsushita UJDA710 "Combo" DVD/CD-RW expansion bay drives. This drive will add CD burning to the DVD and CD playback functionality of your current drive - all in one unit! These are compatible with both Lombard and Pismo PowerBooks, but the DVD playback functionality only works with the 400 MHz Lombard model with DVD decoding built-in. For $220, you get the bare drive if you're comfortable putting your current caddy on the new drive. Let PB Zone do the switch for only $30 more. For $250, they'll replace your drive in the caddy with the UJDA710 and send the new drive and your old unit back to you. The drive is bootable and will come with modified iTunes drivers for both Mac OS 9 and Mac OS X. PB Zone guarantees it with a two year warranty and should be able to transfer your drive's current bezel to the new unit (in a small percentage of cases, this is not possible). The cost for each includes two day shipment back to you. Do you own a PowerBook or iBook? Ever get concerned about how hot it runs? Ever get annoyed when the noisy internal fan starts to run? As Apple laptops have gotten smaller, thinner, and more powerful, they have also gotten hotter. That heat can make the top and bottom panels uncomfortable to touch and can, over time, contribute to deterioration of your 'Book's performance and reliability. The new iBreeze PowerBook cooling stand from MacMice is built to quietly and elegantly bathe the underside of your PowerBook with a gentle cooling breeze. The iBreeze works with all models of Dual USB iBooks and G4 PowerBooks. iBreeze measures 11.75" wide and 9.75" deep. A USB extension cable is included for use with models with side-mounted USB ports. Instead of using one large, loud fan, MacMice used two small (60 mm) whisper quiet fans, each operating at less than one-half their maximum rated speed. Noise isn't even an issue with the iBreeze. And, as clutter is very inelegant, the iBreeze gets its power not from an ugly wall transformer, but directly from the USB port of the connected laptop. There's a female USB passthrough port on the iBreeze, so you don't even have to give up one of your 'Book's USB ports. The subtle silver/gray appearance of today's PowerBooks is clearly evident in the design of the iBreeze. Crafted from the clearest acrylic sheet and backed with a thin coating of silver metalflake, the iBreeze is semitransparent. The iBreeze uses a clear coated, stainless metal braided USB cable to provide both maximum electrical shielding and maximum appearance. The clear polymer bumpers on the top face of the iBreeze are gummy enough to securely hold even a 17" PowerBook in place and are tall enough to provide substantial air flow space between the iBreeze and your PowerBook. iBreeze has an on-off switch, should you decide you don't need the cooling function. 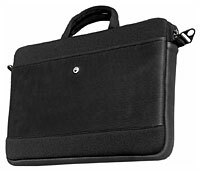 The SportFolio Extreme laptop case offers rugged, high-tech neoprene construction with a built-in plastic shell for impact protection. The exterior features an easily accessible front pocket, a back zippered pocket and a vulcanized rubber bottom and sides for a secure grip. The case zips closed to hold its contents securely. The all-black interior features a soft, plush fabric, and a large pocket. A removable black shock-absorbing shoulder strap is included. MacSkinz are formed plastic "Skinz" that snugly fit over the top of your existing computer panels. They add a personal touch to the already beautiful industrial design of the Macintosh computer and help to protect portables such as the iBook and G4 titanium PowerBook. MacSkinz are molded out of a very tough clear plastic. Most are then silk-screened and/or digitally printed in reverse fashion on the inside to create a scratch resistant product. Others, such as the simulated wood grain or carbon fiber, actually have the "design" embedded in the plastic itself. MacSkinz snugly fit over the existing panels and are secured with the provided nondrying gummy-tape. No tools are required. Simply take a photo of yourself holding up your iBook with a MacSkinz on it and send it to MacSkinz, which will then refund your purchase price of $30.00. Just follow the guidelines below. The offer applies to the first 100 respondents only. The MacSkinz need to be photographed on an actual iBook. The photo must include the Apple Booth Logo at the Macworld Expo in July 2003. The photo should be from the waist up but you does not need to show your face. The original invoice number needs to be submitted with photo. One offer per household. Invoice date must be prior to 7/14/03. Offer ends 8/14/03. Submission address will be included with invoice. Full details on the MacSkinz website. With Bluetooth technology integrated in Mac OS X v10.2, you can link to your Palm OS-based handheld device, Bluetooth-enabled mobile phone, and other peripherals. System requirements: One available USB 1.1 port; Mac OS X v10.2 (Jaguar) or newer. SimpleTech, Inc. announces the availability of its embedded USB Flash Drive, combining solid-state memory and a USB connection for fast and easy data storing and sharing from any computer with a USB port. The embedded USB Flash Drive expands the company's portable storage offerings after the successful launch of its upgradeable USB Flash Drive, Bonzai. SimpleTech's USB Flash Drive eliminates the need for floppy disks and CDs for data storage and sharing. In the office, at home, or on the road, the USB Flash Drive plugs directly into the USB port on a PC or Macintosh. The Flash Drive is recognized as a removable storage device, allowing immediate access for storing and sharing data, including MP3 files, digital photos, games, applications, and more. Measuring 2.7" x .75" x .31" (LWD), the Flash Drive's low-profile design does not block other USB ports when plugged in, and it fits easily into a pocket, purse, or briefcase for convenient travel. For added convenience, the Flash Drive is hot-swappable and does not require an external power source. The SRP is $49.99 for the 128 MB USB Flash Drive, $89.99 for the 256 MB USB Flash Drive, and $179.00 for the 512 MB Flash Drive. TEN Technology has announced the TEN naviPod - the first wireless remote control for the Apple iPod. naviPod is the first wireless remote for the iPod consisting of a receiver that plugs into the top of the iPod and a 5-button infrared remote control that produces the same functions as the Apple iPod wired remote. "naviPod is really going to foster a change in the idea of stereo systems. With the naviPod and a pair of speakers, the iPod becomes a true alternative to the conventional stereo system," says John Lin, CEO and founder of TEN Technology. naviPod was specifically designed to allow the Apple iPod user to control audio functions from across the room. Just plug in a pair of self-powered speakers, or connect to a stereo receiver/amplifier, and the iPod becomes the centerpiece of a digital entertainment system. Play/Pause, Next, Previous and Volume are all right at your fingertips. "naviPod is all about accessing your music how and where you want it," said Eric Prentice, CEO of Dr. Bott LLC, "This product is innovative, elegant, and intuitive. It is always a pleasure to bring a great product like naviPod to market!" naviPod is available in two models, both sporting an audio out port and chrome stand. naviPod for original iPod is compatible with all generation 1 and 2 iPods with FireWire port and includes a pass-through FireWire port for keeping the iPod charged. naviPod for 3G iPod is compatible with all iPods with the new Dock Connector. naviPod for original iPod and naviPod for 3G iPod are available for preorder from Dr. Bott and its authorized resellers, along with the Apple online store. Both models of naviPod retail for $49.95 US/$69.95 CAN.